Glenwood's Erik Novy rounds a bend during Sunday's race. Glenwood's Emma Barsness raises her arms as the race winner on the race podium Sunday afternoon. Glenwood's Lucca Trapani races downhill during Sunday's race in Frisco as a spectator looks on. 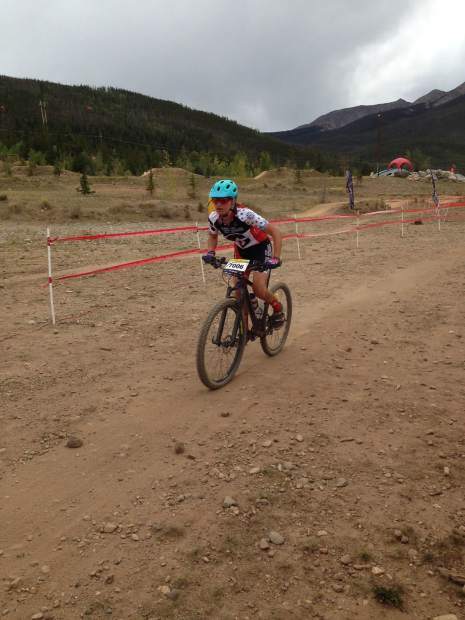 Ella Lindenberg pushes the pace during Sunday's mountain biking race in Frisco. Christian Villareal's chain broke near the end of Sunday's race, causing him to run across the finish line with his bike. 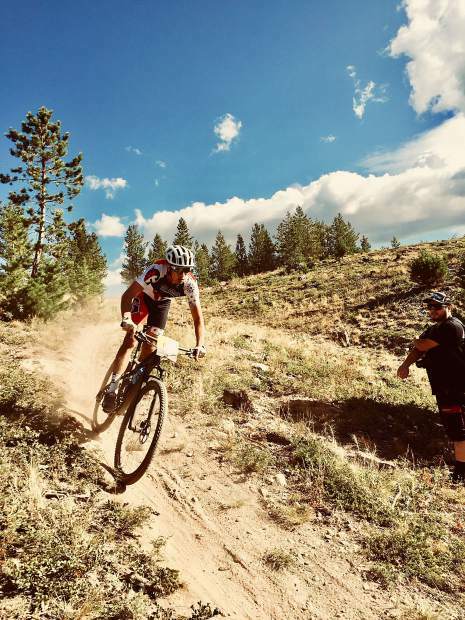 Mountain Biking is alive and well at Glenwood Springs High School, as evidenced by the record number of 19 Dirt Demons who traveled to Summit County Sunday afternoon for the start of the fall season. The Frisco Invitational was held under perfect racing conditions at the picturesque Peninsula Recreation Area, overlooking Dillon Reservoir. Sailboats dotted the blue water in the distance below the 6-mile dirt course, which featured 600 feet of elevation gain per lap. Racers pedaled over dry, dusty climbs and technical, rocky descents before dropping down to the grassy start/finish area at the Frisco Adventure Park. 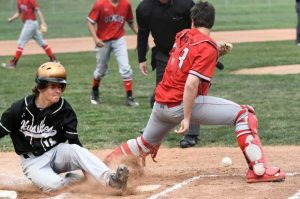 Nearly 1,000 high school students represented the South Conference of the Colorado League. This is the fourth year of Glenwood High’s membership in the National Interscholastic Cycling League and by all measures it has been a huge success, building each year from the inaugural team size of just six racers in 2015. 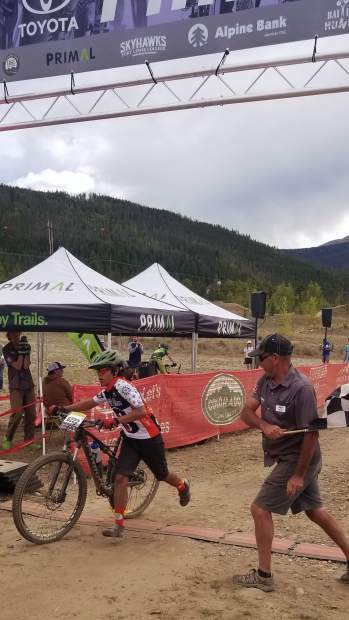 In addition to the 10 returning upperclassmen, nine freshman boys and girls bravely rolled up to the start line, most of them for the first time on a mountain bike. At the end of the day, the Demons racked up several top results, and had lots of tired but happy racers. Top-five finishers for the Dirt Demons included Emma Barsness, who won the Freshman Girls division in her high school debut, sophomore Erik Novy placing third in Junior Varsity Boys, and Lucca Trapani coming in fifth in Varsity Boys. 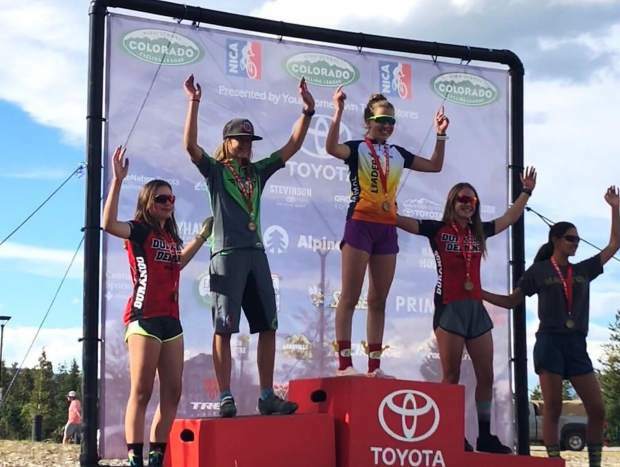 At the awards, Barsness was presented with the Colorado League Race Leader’s jersey, which she will wear in the next race. 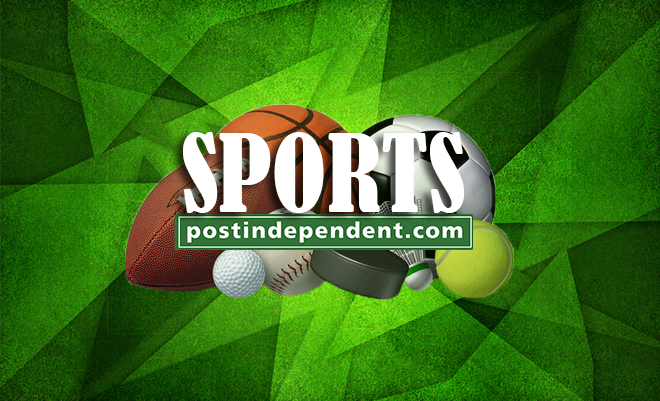 Top-ten finishers were junior Lizzie Barsness, finishing seventh in the Varsity Girls race, and sophomore Kawak Miranda, who placed eighth in JV Boys. As Glenwood’s sole senior, Trapani kicked off the day’s racing with the varsity boys at 8:30 a.m. 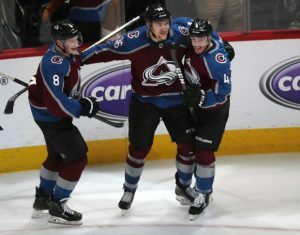 He went out hard on the paved uphill start and led the thundering 48-rider pack as the course turned onto a dirt double-track. Freshman Oliver Patrick followed Trapani’s advice and later led his heat of 65 riders as they crested the start hill. Freshman Kailey Murphy reported three crashes during her two laps around the peninsula. 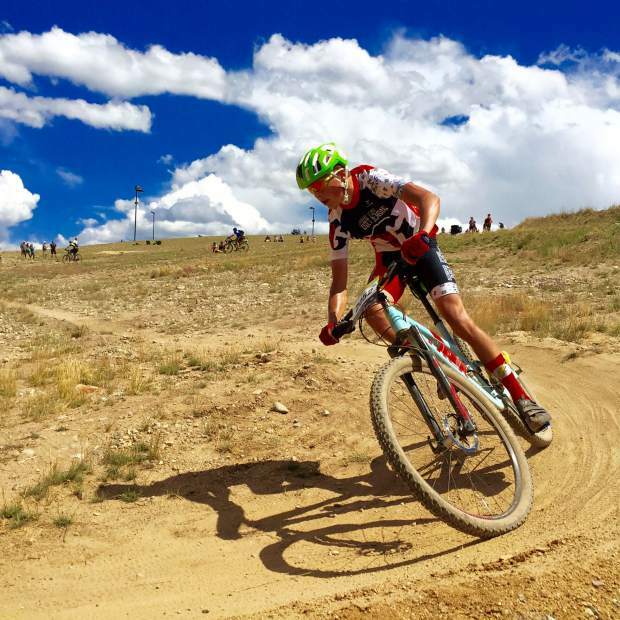 Next up for the Dirt Demons is the Cloud City Challenge in Leadville on Sept. 9. The course is located on the Colorado Mountain College campus’ Nordic trail system, at 10,077 feet in altitude. Registration is still open for the three remaining races in the fall season, and interested students can contact Coach Randy Tuggle at randy@glenwooddirtdemons.com.